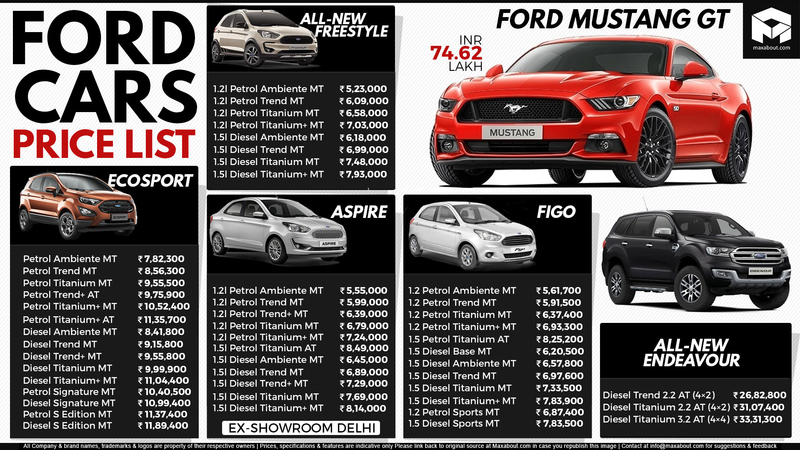 Ford is a direct rival to India’s best selling car brands, retailing one product in every possible segment in the country. The volume generators from the American brand are EcoSport and Freestyle, further including the Aspire sedan for more than 7000 units on sales chart each month. The full-sized Endeavour SUV from Ford rivals Toyota Fortuner and Mahindra Alturas while the EcoSport is a rival to Maruti Brezza and Tata Nexon. They have updated almost every model, except for the Figo that will feature the same frame as the new Freestyle. Ford Mustang GT is an exclusive muscle car from the brand with a 5.0L, V8 engine. The brand will update the same to 2019 variant once the right-hand drive Mustang stock for the 2018 year ends. The updated Aspire, along with Freestyle and EcoSport, use 6-airbags for maximum passenger safety. The top-spec Ford Endeavour Titanium 3.2L comes with 7-airbags.